the file, save and exit. The now missing packages will then be removed. default settings to reflect the reality and sort overlay options. With our own beta out the way I got a moment to compile Qt 4.4 beta. It adds QtWebKit packages for those who missed it in my last 4.4 packages. Seb Ruiz (sebr): Wordpress Comment Spam, Anyone? For those of you wondering where I’ve been, it’s Malaysia and Indonesia for the past two months (stories and photos). Not that anyone wants to hear about that, though! Has anybody noticed a remarkable spike in wordpress comment spam in the last week? I’ve had to defer all comments for moderation due to the massive amounts of crap that’s coming through. More importantly, does anybody have any suggestion of a way to get around it? Update: Just noticed that all my permanent pages and comment captcha is missing. This disturbs me greatly. - Repository copy from p5-JSON to p5-JSON1. - Mark p5-JSON1 as conflicting with p5-JSON-2.x. - Upgrade p5-JSON to 2.07 and mark as conflicting with p5-JSON-1.x. - Use CPAN macro, add Test-Simple dependency and improve pkg-plist. So yesterday after arriving at the hotel at 3am for the third day in row, and Tobias indicating that he wanted to go for breakfast at 8.30am, I decided that I'm old enough to decide on my own and prefer to do the breakfast at 10am, something that in the spirit of the akonadi meeting is called 'a more than excellent night of sleep'. When I arrived at the KDAB building we had like another 15 minutes together before Kevin had to leave to the trainstation. So we rushed through the thing we just had to do together: prioritising the TODO list on the wiki and assigning names to the things we absolutely have to do before KDE 4.1. Sebastian Kuegler: All ur ChangeLog r belong to us. Plasma already has a head start, last week Aaron copied the template over to the Plasma section on techbase: Plasma User Research Profile (PURP). This will be a great activity to work on at the upcoming Plasma meeting in Milan. If you have any questions, feel free to ping me. Urs and Nookie have worked together on a Webinterface. It’s pretty nice imo and there were already some Screenshot of it @ jarzebski.pl. - Update to version 0.6.2. - Update to version 1.2.35. RE: Konqueror, and KDE reinventing every wheel? 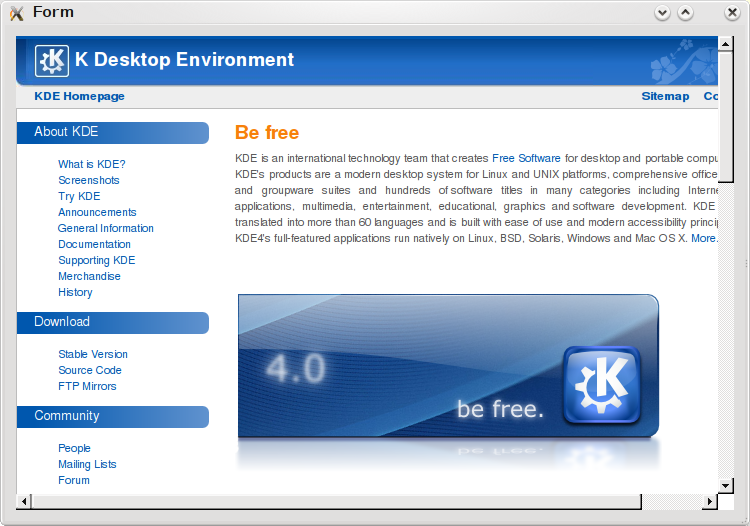 "Many KDE users tend to take the Konqueror Web browser for granted, but that's a mistake. Konqueror may not be able to replace Firefox as a Web browser for every site, but it does a lot more than just simple browsing." The digiKam development team is happy to release 0.9.4-beta2. The digiKam tarball can be downloaded from SourceForge as well. Note! This release works only with the latest libkdcraw and libkexiv2. You either have to compile them freshly from svn or wait a few days until the tarballs become available. Генерация: 0.224 сек. и 41 запросов к базе данных за 0.141 сек.